Give a scientist a script and they will analyse data for a day. Teach a scientist to script and they won’t have any more time to do analysis for the rest of their lifetime. Scripts are a great way to make reproducible workflows, but they are too technical for many situations where you have to report to scientists. Jupyter notebooks are a great way to do an analysis, and report the results at the same time. A Jupyter notebook can contain the analysis, the results, and the documentation that explains the results together in a single file, making it at once understandable and reproducible. Jupyter started its life as IPython, or “interactive python”. But since they added support for other languages besides python, they had to rename. In principle you can install support for a wide range of scripting languages, but in practice it may be a little difficult to set up. Jupyter consists of multiple ‘kernels’, to get support for a different language you have to install that language, and then install the Jupyter kernel for it. It took me a while to get that working for the R scripting language. What follows are some notes I took during that process, in the hope that they are useful for anybody else trying to do the same thing. First you need to have R and Jupyter installed, but I’m assuming you already got that far. Anyway, that is the easy bit. Problem #4 – we installed the very latest rzmq fresh from source code, which now requires R version 3.1.0. I’m using a Long-Term-Support (LTS) version of Linux Mint and I don’t want to switch R versions as that could create a hassle elsewhere. Does rzmq really require 3.1.0, or does it merely say it does because it’s pretending to be cutting edge? Let’s hack it up some more. Description: Interface to the ZeroMQ lightweight messaging kernel (see &lt;http://www.zeromq.org/&gt; for more information). And now the R kernel installs without further problems for me. I haven’t noticed any incompatibilities with earlier R versions yet, R 3.0.0 seems to be just fine. We can now easily solve the problem of bioinformatics data integration. But how do we put that data in the hands of scientists? At General Bioinformatics we put data in triple stores, and use SPARQL to query that data. Triple stores are great for data integration, but you still have to figure out how to put that data in the hands of scientists. Integrating data is only half of the problem, we also have to present that data. The problem isn’t that SPARQL is hard to use per se (it’s really rather plain and sensible). The problem is that SPARQL is supposed to be only a piece of plumbing at the bottom of a software stack. We shouldn’t expect scientists to write SPARQL queries anymore than we expect them to carry adjustable pliers to a restroom visit. The General SPARQL app is one of the new ways to present triple data. The app lets you build a network step by step. Nodes and edges can be added to a network in a piecemeal fashion. Nodes can represent various biological entities, such as: a pathway, a protein, a reaction, or a compound. Edges can represent any type of relation between those entities. For example, you can start by searching for a protein of interest. The app places a single node in your network. You can then right-click on this node to pull in related entities. For example, all the pathways that are related to your protein. Or all the Gene Ontology annotations. Or all the reactions that your protein is part of. Or the gene that encodes for your protein. And you can continue this process, jumping from one entity to the next. In the background, the General SPARQL app maintains a list of SPARQL queries. Each item in the search menu, and each item in the context (right-click) menu, is backed by one SPARQL query. When you click on them, a query is sent off in the background, and the result is mapped to your network according to certain rules. When you first install the app, it comes pre-configured with a basic set of SPARQL queries, although it’s possible to provide your own set. 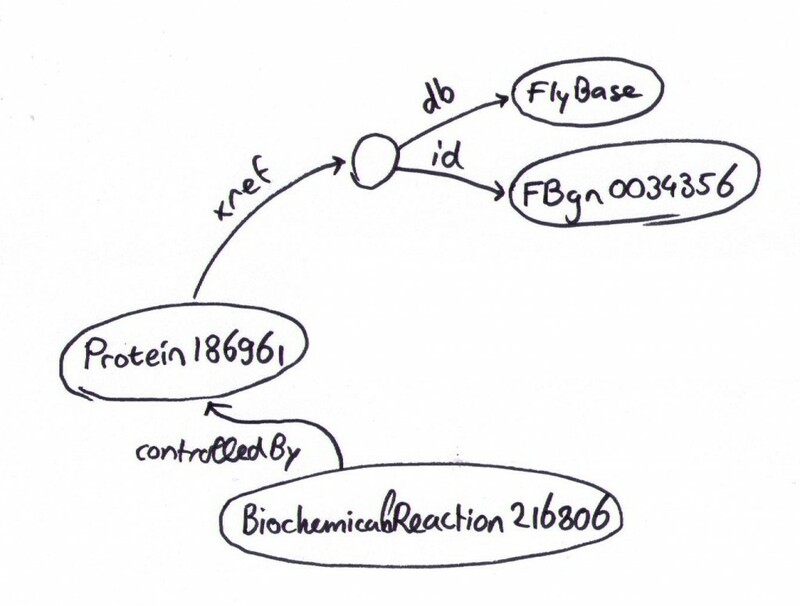 The initial set is designed to work with public bioinformatics SPARQL endpoints provided by the EBI and Bio2RDF. But as great as these resources are, public triple stores can sometimes be overloaded. The app works with privately managed triple stores just as well. The easiest way to get the app is simply from the Cytoscape App manager. Just install Cytoscape 3.0, start it, and go to menu->Apps->App Manager and search for “General SPARQL”. Or download it on from the app store website. What’s even better is that the source code is available on github. Also, if you have a chance, come see my poster at Vizbi 2015 in Boston. In large companies, you often find that direct web access is blocked: you have to ask a proxy server to request web pages on your behalf (The proxy also does stuff like scanning for viruses and malware). As a consequence, all the software on your computer needs to be configured to be proxy-aware. This is usually done for you, but Bioinformaticians tend to use “non-standard” software that you’ll have to configure yourself. If you are using Cytoscape 2.X or 3.0 behind a proxy, and you know your proxy settings, you may find the following useful. Cytoscape has a “proxy server settings” dialog, as described in the manual. The problem is that it doesn’t work – it stores the proxy settings in a special way that only some bits of Cytoscape are aware of. It does not work for plug-ins (sorry, “apps”) that make use of off-the-shelf Java libraries. Instead, go to your Cytoscape installation directory, and look for a file named Cytoscape.vmoptions. Enter the following lines at the top. Substitute the dummy host (192.168.5.130) and port (8080) values for the appropriate values of your proxy. This method works for Cytoscape internally as well as plug-ins and libraries, so you can just ignore the internal Proxy configuration dialog. I’ve tested this for Cytoscape 2.8.2 and 2.8.3, and it’s also relevant for Cytoscape 3.0. 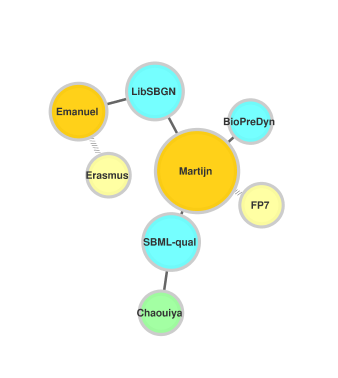 People from the Cytoscape mailinglist inform me that this will be changed in the upcoming Cytoscape 3.1. I recommend putting the options at the top, because Cytoscape.vmoptions has a maximum of 9 options. Any more are quietly ignored. The next two deal with anti-aliasing for font rendering. That’s ancient stuff, I can’t remember the last time I saw a Java application without anti-aliased fonts. I think you can remove them safely, and in the worst case you’ll just get some ugly text. Finally, a note for Java developers: if you are trying to debug proxy issues, use the following snippet of code just before you make a web request. Sometimes the values of system properties are not what you think they are – with this you can confirm them. The internet is surely the most incredible machine on earth. For one thing, I use it to share code with other developers, using a program called subversion. But the other day, subversion was being blocked by a firewall. Fixing that problem was a great opportunity to get my hands dirty with the nuts and bolts of the internet, and I learned a lot too, which I’d like to share here. First let me explain about ports, because it will be important later. 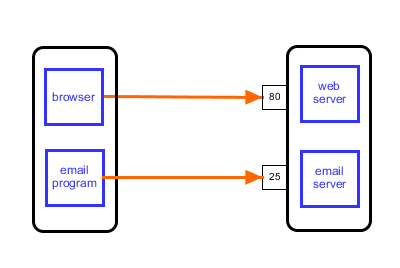 An internet connection always involves two programs: one is the client, running on the local machine, and the other is the server, running on the remote machine. For example, the client could be Firefox on the wife’s laptop, and the server could be Apache serving images of kittens. Now imagine that the remote machine had both a web server and an email server installed. To distinguish the traffic for each program they are assigned a port number. The web server is listening on port 80, which is the conventional port for web traffic. The email server is listening on port 25, and both happily co-operate on the same machine . The client and server must speak the same language, or protocol, to communicate. There is a whole alphabet soup of protocols such as HTTP, FTP, SMTP… Not surprisingly most of them end with the letter P. The most common one is HTTP, being the protocol used for web browsing. This protocol dictates that the browser should start by sending a request. This can be one of several request types, e.g. GET to request the latest kitty pictures, and POST to upload new ones. 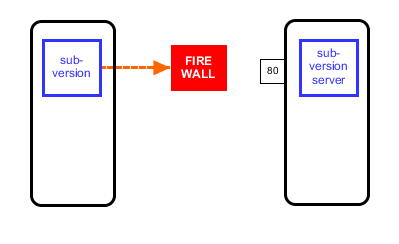 Firewalls are designed to let through the ordinary, and block the unusual. 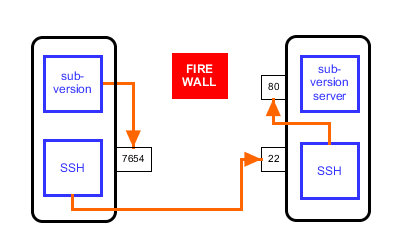 Since HTTP is so common, firewalls normally let it go through unharmed. Subversion also uses HTTP, but still it was being blocked . This is because subversion uses rather weird HTTP request types, such as PROPFIND . This is legal according to the protocol, but it’s unusual. Firewalls find that suspicious. It’s not because subversion is trying to be funny. Honestly, I think that blocking PROPFIND is just the default setting on popular firewall software, and the sysadmins don’t bother to change the defaults. After all, Subversion is only used by developers, who make up just a fraction of the population, and they are geeks anyway, so nothing to worry about. First, I instructed subversion to send its requests to localhost, instead of the subversion server, and to use port 7654 instead of 80 . So instead of doing a subversion checkout from http://svn.bigcat.unimaas.nl/bridgedb/trunk, I was doing it from http://localhost:7654/bridgedb/trunk. What is localhost? Localhost corresponds to IP address 127.0.0.1, which is a special address that sends messages right back to where they came from. Every computer, no matter how simple, can act as a server, as long as it has suitable software listening on a port. What would be the use of that? The messages are already at localhost, so there what is the point in sending them there? As mentioned above, internet communication is always between two programs. They communicate even if they are written in very different programming languages, as long as they follow the right protocol. Connecting over localhost is sometimes the easiest way to get two very different pieces of software to talk to each other. So I instructed SSH to set up a tunnel. What this means is that SSH is listening to port 7654, where it was receiving all messages from subversion. SSH does not interpret these messages, it just encrypts them, and forwards them over the internet. The unusual PROPFIND requests are now obscured by encryption. The messages arrive at the remote server on port 22, where another copy of SSH decrypts the messages and passes them on again. They continue the journey to localhost (from the servers point of view), on port 80, where the subversion messages were expected to arrive in the first place. The beauty of this is that in spite of all the redirection, both the subversion client and server are oblivious to what is going on, they just send and receive messages as usual. Except that in my case… it still wasn’t working. The problem is that this particular server is actually hosting two websites: http://bridgedb.org and http://svn.bigcat.unimaas.nl. This server was configured with a technique called virtual hosting, which is useful when you want to host several small websites. Putting each on a separate computer would be very inefficient. With virtual hosting, you can bundle multiple sites on a single server. So what to do? Next, I tricked my local computer into thinking that svn.bigcat.unimaas.nl and localhost are the same, by adding the following line to the hosts file, which is in C:\Windows\System32\drivers\etc on windows, (you need to open notepad with sysadmin rights in order to be able to edit the file) or in /etc/hosts on linux. This tells the operating system, that when you make a request for svn.bigcat.unimaas.nl, it should really be sent to 127.0.0.1. Which coincidentally is the IP address for localhost. This means that I can configure subversion to send to svn.bigcat.unimaas.nl, even though svn.bigcat.unimaas.nl is really localhost due to the hosts file, except that localhost really is svn.bigcat.unimaas.nl due to the SSH tunnel. I have had problems with PROPFIND before, see also my question on stackoverflow to diagnose the problem. Cytoscape is a popular network visualisation and analysis tool. It’s great because it’s so easy to create plug-ins. Today I was fortunate enough to be attending the Cytoscape developer workshop at Vizbi 2012, where I learned a few new things. Firstly, one of my goals was to find out about the current state of Cytoscape development. Cytoscape is a great tool as long as you don’t look too closely at what’s going on inside. The upcoming third version promises to fix all the minor and major problems that exist under the hood. But Cytoscape 3 has been in the making for a long time. As a plug-in developer, you have to choose between something that works right now, but will go away eventually, or something that is clearly the future, but might take a long time to materialise. The feeling I got from the workshop is that there is light at the end of the Cytoscape 3 tunnel. For a plug-in developer with a deadline, it’s probably best to stick with the current version for now. But if you’re not under pressure to release, it’s definitely possible to write for Cytoscape 3 and make use of a nicer and more pleasant working environment. For the visual style, I created one in Cytoscape and saved it as style.props, using Export->Vizmap property file. And here is the magic bit: If you save the above three files in your work directory, then you can generate that picture with the script below. A few months ago, I started work as a post-doc at the Systems Biomedicine group of the EBI. Our group makes heavy use of logical modelling as a means to understand how pathways work. For me, the most interesting thing about logical modelling is that it shows a very dynamic picture of how a pathway changes over time. By comparison, the pictures that you get from WikiPathways are very static. We have our own logical modelling software called CellNetOptimizer (a.k.a CellNOptR). One of my current projects is to make the CellNOptR software more interoperable with popular tools such as Cytoscape. To this end, Emanuel Gonçalves, a master student in our group, has implemented a plug-in that makes CellNOptR available from Cytoscape. Work on the plug-in is progressing nicely. Below you see the video that he made, to show off some of the features of this new plug-in. The laboratory of bioinformatics of Wageningen University has put together some really cool hardware. 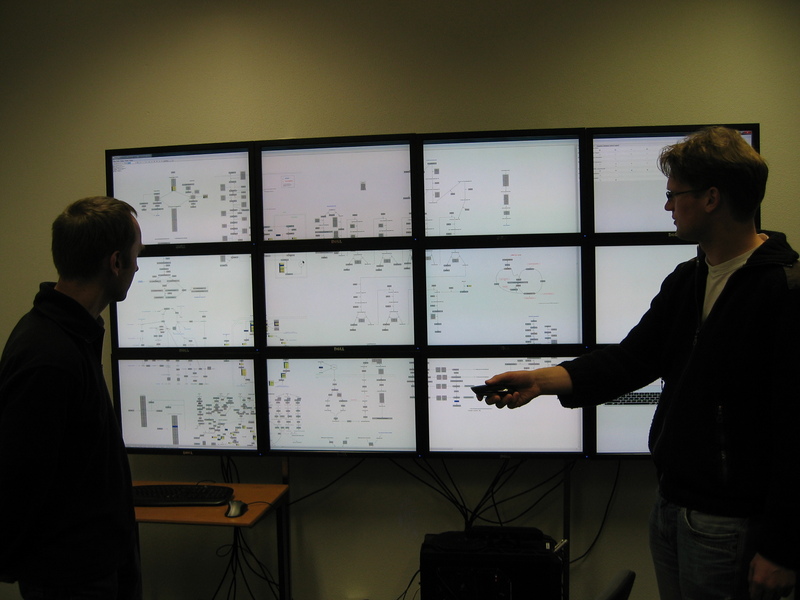 In the picture below you see their tiled display, consisting of 12 high-resolution monitors, powered by a single workstation. This setup gives you a lot of resolution to play with. We managed to display all major metabolic pathways from WikiPathways simultaneously, at full resolution, and map microarray data as well. When you’re standing right next to the screens, it feels like the data is all around you. That really encourages you to explore, and make connections across the pathways. That’s just much harder to do on a single screen.